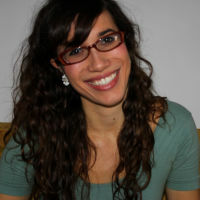 Meeting a new person and then flirting with them can be a tense, sweaty experience. Chances are you’re going to say some words they’ve heard before, which is boring; you’re going in with one strike against you. Why not give yourself a fighting chance by arranging those words in new and riveting constructions to reveal odd facts you have recently learned from Wikipedia? You practice shoehorning unrelated facts into casual conversation. 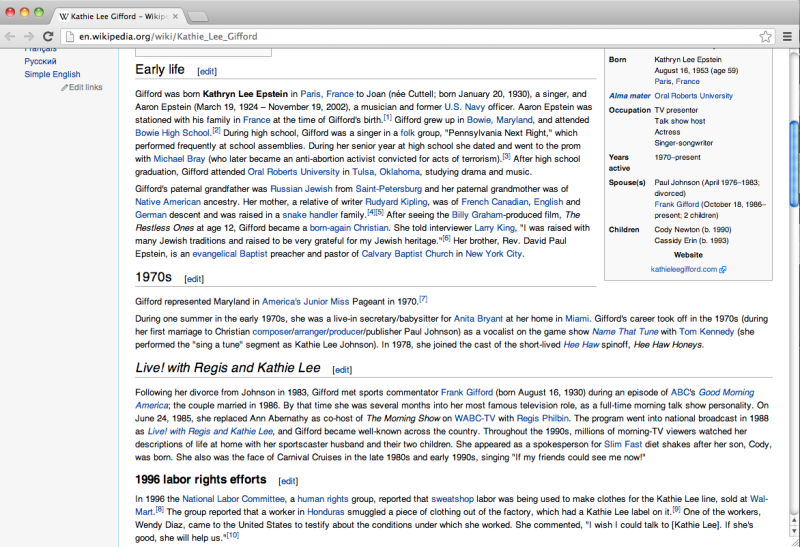 Let Kathie Lee Gifford's fascinating Wikipedia page do the rest. 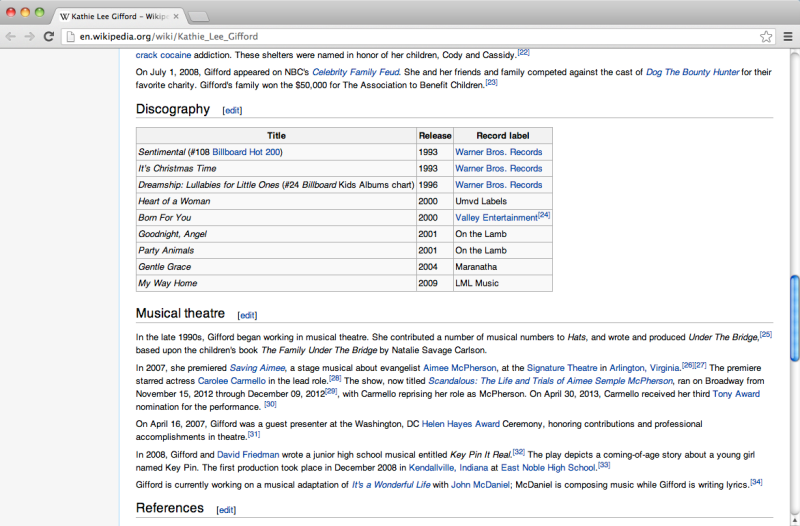 Interesting Because: Kathie Lee's life is a thousand times weirder than you ever imagined. Jumping off points: Morning shows, Paris, sweatshops, snake charmers, carnival barkers, Jews, Native Americans, born-again Christians, Anita Bryant, the Kennedys, Michael Bray, cruises, SlimFast, crackbabies, terrorists, junior high school musicals, etc. The least interesting thing about Kathie Lee Gifford is that she is a snippy day drunk who encourages women in white pants to get bombed at 10 a.m. Think about that for a moment. That is the LEAST interesting thing about her. So before you force another stranger to make awkward conversation with you about the temperature of the room you are in ("It feels just right in here!") 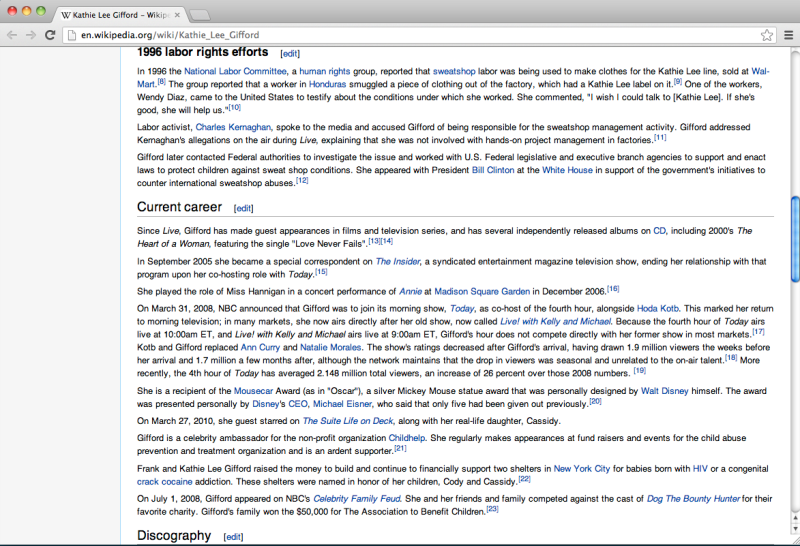 take a minute to read and memorize these and other key facts from the Kathie Lee Gifford Wikipedia article. You—and your future spouse ;)—will be glad you did.